I hope the weather is warming, and the strawberries are flowing where you live. 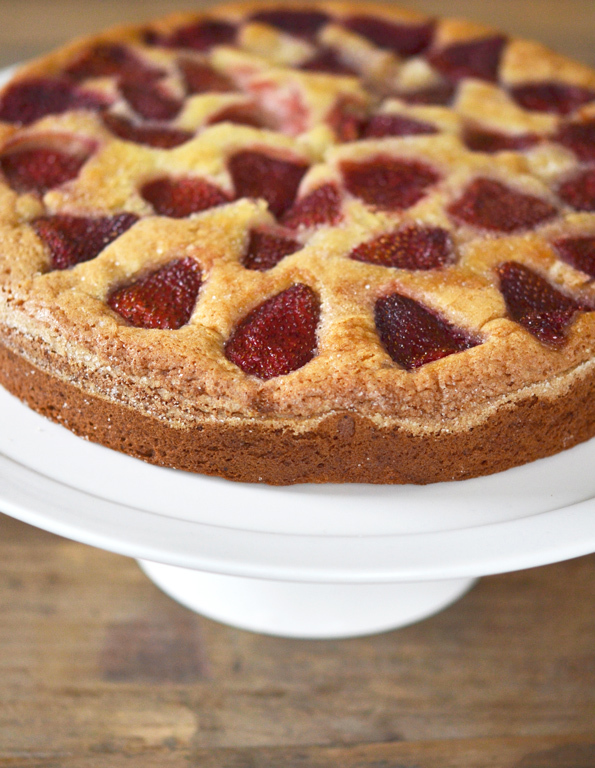 The best thing about this gluten free roasted strawberry cake? 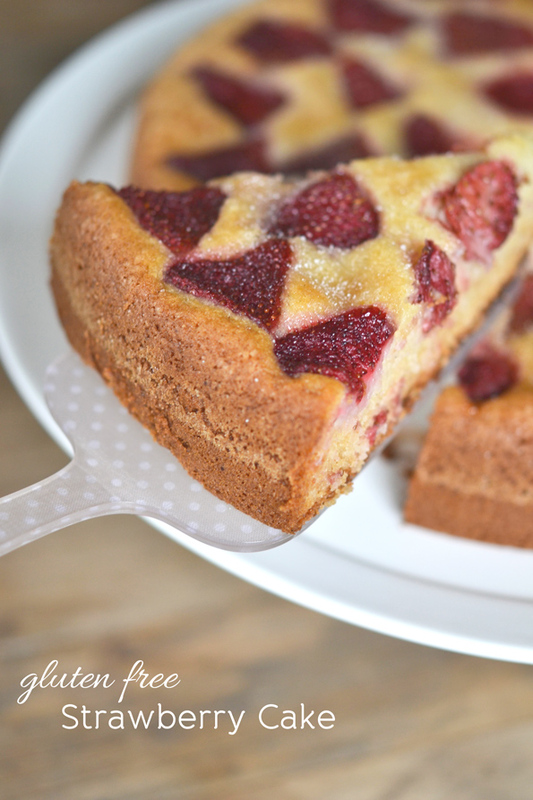 If your strawberries are not at their peak (like mine), this is the cake for you! Maybe you have a batch of my make-your-own gluten-free vanilla cake mix from page 193 of Gluten-Free on a Shoestring Quick & Easy in your pantry? Use that in place of the dry ingredients in the recipe below (flour, xanthan gum, salt, baking powder, baking soda and sugar). It’ll work just fine! You could even make this dairy-free if you use the dairy-free vanilla cake mix on page 195, and replace the butter with an equal amount of melted and cooled vegetable shortening. So many options! You could even make this dairy-free if you use the dairy-free vanilla cake mix on page 195, and replace the butter with an equal amount of melted and cooled vegetable shortening. So many options! Want even more options? 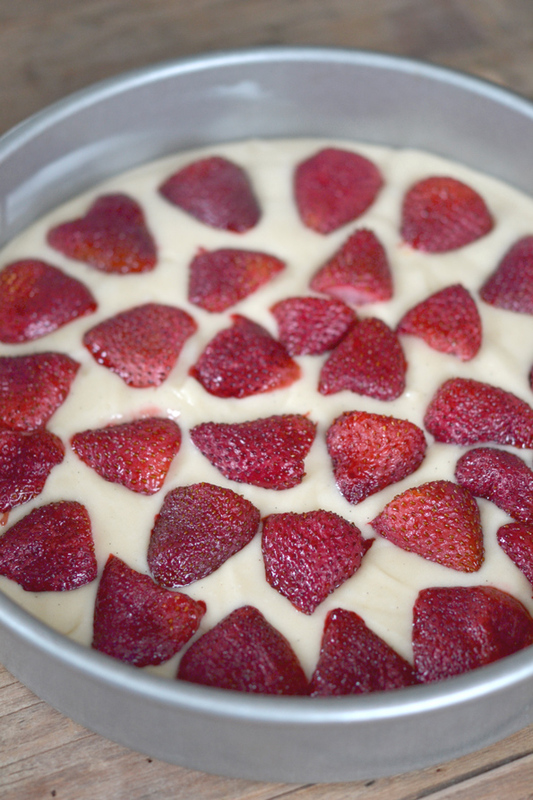 Make this a simple gluten free strawberry cake, and 86 the strawberry-roasting. 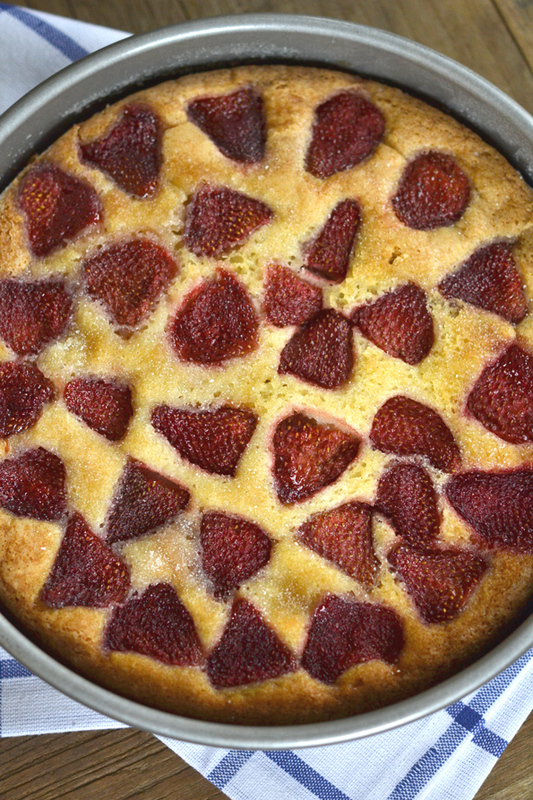 Just eliminate that step in the directions, and bake the cake for about an hour instead of 40 minutes, as the fresh, unroasted strawberries will hold more juice than the roasted ones do. Before you make that decision, though, just look at what happens when you roast the strawberries first. They release much of their juice and it caramelizes in the oven, turning even the wimpiest strawberries into sticky, bright red delights, with the deep flavor to match. Roasted strawberries would also probably be perfect in this Paleo Strawberry Pudding Souffle from Natalie of Perry’s Plate. I’m going to have to try that! Then just nest them, cut side down, on top of the smooth, gluten free vanilla cake batter, and bake away. The cake will really be so moist that it keeps for days, just sitting there on the counter, loosely covered (if you have a cloche that fits over a cake plate, that’s perfect, but some plastic wrap will do just fine). The tricks for success are: (1) cover the cake in the oven if it starts to brown too quickly, (2) bake it in a light-colored metal pan or it will bake too quickly on the outside, and (3) bake only until a toothpick inserted in the center comes out mostly clean, not clean-as-a-whistle, as the top layer should have a bit of a custard-like texture. Preheat your oven to 350°F. Grease a 9 inch round cake pan, and set it aside. First, roast the strawberries. Line a large, rimmed baking sheet with aluminum foil and grease it with cooking spray. Place the strawberries on the prepared baking sheet, toss them with the sugar and salt, and spread the strawberries into an even layer on the baking sheet, cut side down. Place the baking sheet in the center of the preheated oven and roast the strawberries for 35 minutes or until they are very soft and their juice is reduced to a thick liquid. 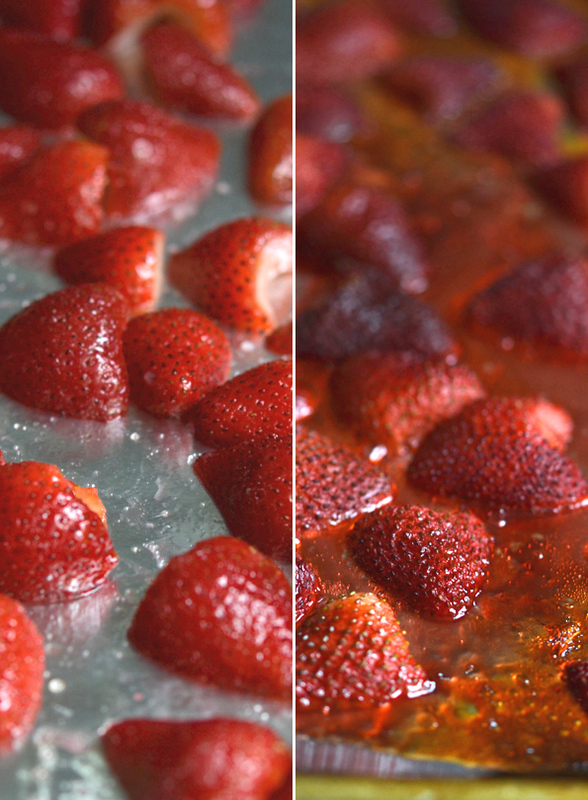 Remove the strawberries from the oven, and set aside to cool briefly. Make the cake. In a large bowl, place the flour, xanthan gum, salt, baking powder, baking soda and sugar, and whisk to combine well. Add the butter, egg, vanilla and milk, and mix to combine after each addition. The batter will be smooth and thickly pourable. Pour the batter into the prepared round cake pan, and smooth into an even layer. Place the roasted strawberries, cut side down, on top of the cake batter about 1/2 inch apart from one another in concentric circles. Place the cake in the center of the preheated oven and reduce the oven temperature to 325°F. Bake until the cake is light golden brown, has begun to pull away from the sides of the pan, and a toothpick inserted in the center comes out with a few moist crumbs attached (about 40 minutes). If the cake begins to brown too quickly, cover it loosely with aluminum foil. Remove the cake from oven and allow it to cool for at least 10 minutes before transferring to a wire rack to cool completely. P.S. If you haven’t yet, please pick up a copy of the each of the Gluten-Free on a Shoestring cookbooks. I can’t keep the blog going without your support! This is such a nice and yummy cake, thank you Nicole! Cannot wait for your bread cookbook! I wouldn’t suggest trying to replace the powdered milk with liquid in a flour recipe. It isn’t a 1:1. I would suggest that, if you don’t to use dry milk, just use the Mock Better Batter blend! I just pre-ordered your bread cookbook! The strawberry cake looks so yummy. Will need to try it! Is it possible to use almond and /or coconut flour with this? Do you think it would hold together? It would not work, Lara. Almond and coconut flour are very different from an “all purpose gluten free flour” blend. Sorry! I love it, Margaret! Actually, this is an important question and I’m very glad you brought it up: the rule is, if you wait for the kids to get home, you’re in big trouble. With me. Big. Trouble. Definitely going to have to print this one out! How big of strawberries do you use, and does it make a difference? Up here in WA state, we can get incredible strawberries, but they’re smaller than what is usually found in grocery stores and more delicate. Is the roasting something best used with those bigger berries found in the stores? And, yes, what do you recommend be done with the roasted juice? Use is as a glaze for the cake pieces? It doesn’t much matter how big the strawberries are, Maggie. The roasting intensifies the taste of the strawberries, and is particularly good for early in the season when they’re not that sweet and late in the season when they tend to get bruised. But it also just generally great for flavor, and for allowing you to bake the cake for less time, resulting in a more moist cake. The juice is very thick and sticky. It isn’t at all pourable, and there isn’t much left of it, I’m afraid, especially once the strawberries cool as they absorb some of it. This looks soo heavenly. I’m going to be making it soon. I know this makes me sound like I grew up in the depression (I did not!) but what did you do with all that lovely caramelly juice that came off the strawberries? could you spread it on toast? it just looks kind of lovely to waste to me….. Okay, do you seriously think you would be judged, here of all places, for not wanting to waste, Jennifer? This is gluten-free on a shoestring! Waste-not, want-not! Unfortunately, there isn’t much juice left. It is very thick and sticky, and not at all pourable. The strawberries themselves reabsorb some of as they cool, too, so really most of it goes in the cake (which is mostly good news, right?). Oh ok – good to know about the strawberries! So, I just went and pre-ordered the new bread book from Amazon. It said it would ship Dec 3 or later. : ( I thought it was coming out in November!!! Beautiful cover by the way!